We are a group of creative types creating things in creative ways. After years of working with paper, metal, wood, epoxies, thread and pixels, we’ve refocused our efforts into the future: by way of laser beams and poly-lactic renderings! With a lab full of 3-D Printers, a 100-watt laser, and some style we are embarking unto the unknown future of craft-making in multiple dimensions. Join us as we boldly go forth to burn art with focused light and melt recyclable organic compounds into every day objects! The Crafters of Tomorrow are primarily made up of the minds at Inscriptu, Inc. and anoki.net in sunny San Diego, CA. Clyde and Michael of Inscriptu have been laser engraving and etching for over 10 years, while Anoki has been busy creating designs, illustrations, and crafts since he was bit by a radioactive computer. 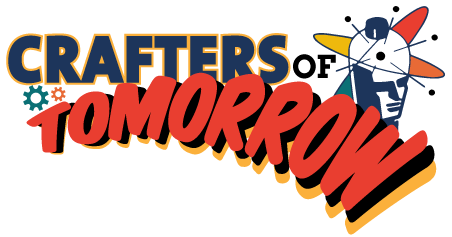 Combining their powers, they merge to form the awesome and unstoppable super-team “The Crafters of Tomorrow”, powering up to give them heightened speed, strength, and creative agility and power over all dimensions!